Reveille, 30 September 1931, p 6. The article deals specifically with the 11th Light Horse Regiment and a particular group of reinforcements. The reinforcement group mentioned is the 11th Light Horse Regiment, 20th Reinforcement, which embarked from Sydney, New South Wales on board the HMAT A38 Ulysses on 19 December 1917. Most of the reinforcements arrived for absorbtion in the 11th Light Horse Regiment by April 1918. 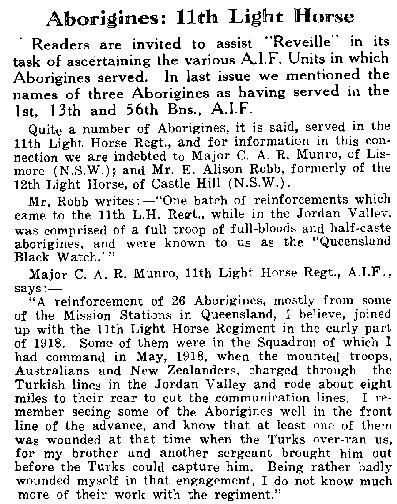 Apart from four other men in this group, the 11th Light Horse Regiment, 20th Reinforcement was the only exclusively Aboriginal formation created within the AIF during the Great War and so holds a special place in the recognition of the Aboriginal participation of this conflict. This article in the November 1931 edition of Reveille was the follow up of the first article displayed above. Reveille, 30 November 1931, p 22. 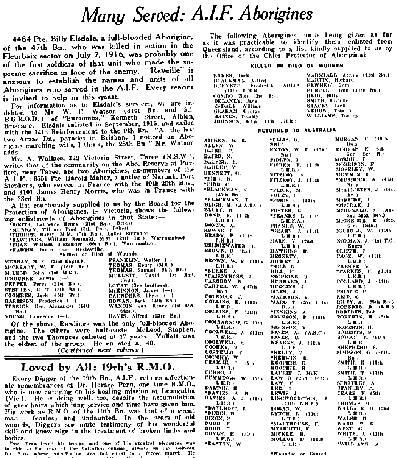 This was an important piece of work in the process of identifying those members of the AIF who were of Aboriginal origin. The list is far from complete and is of dubious accuracy but it does provide the researcher with some solid information. Where service numbersare given in the list, the accuracy of the list comes into its own. Notes by the Aboriginal Protectors of Victoria and Queensland are indicative and issued with the best knowledge available at the time. Spelling variations are not accounted for nor are a number of other factors which generally reduces the value of this list.